Rita’s Italian Ice is one of those things we’ve missed most since moving to Nashville. We hail from Virginia, where the Italian Ice flows like water (and ironically is also known as Water Ice in select locations). A little birdie told us that two Rita’s locations were coming to the Nashville area, and although they’re inconveniently located in Hermitage and Mt. Juliet, we’ll take what we can get. The Hermitage location (4219 Lebanon Pike) is now open, and will be dishing out free regular sized Italian Ices through the end of next week. They’re even open on Labor Day. Conveniently, we’re off work on Labor Day, and it seems that a trip to Hermitage may be in our future. 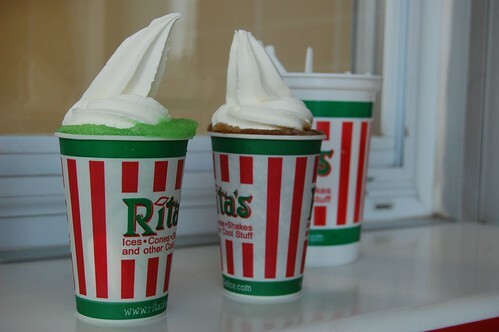 Rita’s is famous for their freebies, generously giving away free ices on the first day of Spring every year as well. So that’s two things to look forward to: Spring and Mt. Juliet. Oh, and we’ve heard rumors of sweet tea italian ice. Stay southern, Rita’s. Photo by Bright_Star. H/t @vanderbiltwife.